With three players scoring in double figures and two last-second free throws from fifth-year guard Max Allin, the Wilfrid Laurier Golden Hawks men’s basketball team were able to hold on for a slim 86-84 victory against the league worst Brock Badgers. The Hawks got off to a slow first half in their game against the Badgers, but were able to bounce back in the second half to pick up a much-needed victory in a foul-filled game. “Well every game’s huge for us at this point,” Laurier’s leading scorer Allin said. After back-to-back losses Laurier is in a position where the Western Mustangs are right on their heels searching to take the third spot from them in the Ontario University Athletics (OUA) West division. After outscoring Brock 27-21 in the opening quarter, Brock was able to take the lead going into the second half with a 10-0 run to finish the second quarter. 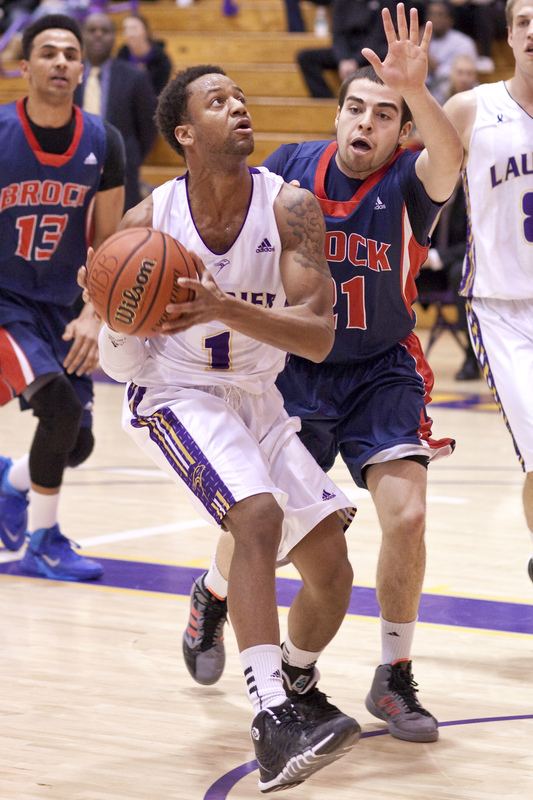 Brock rookie and leading scorer Dani Elgadi was able to take advantage of a slow Laurier start and put up 16 first-half points before getting into foul trouble early in the second half. He finished the game with a double-double of 22 points and 11 rebounds. With third-year Will Coulthard not scoring any points in the first half and Allin struggling early, it was up to Jamar Forde to lead the team both offensively and defensively as he was able to put up 20 points and 15 rebounds throughout the game. But as they have done all season, both Coulthard and Allin were able to find their scoring touch. Coulthard was able to pour in 16 points all in the second half, while Allin was able to score 20 of his 24 points in the second half. After the game, Allin was asked how he was able to turn it on in the second half. The entire game was plagued by fouls, with 54 free throws being taken between the two teams, but no free throws were more important than the final 27th and 28th shots for Laurier with one second left on the clock. With the game tied at 84, Allin was fouled driving to the hoop and was awarded two shots. As he has done throughout his career, he was clutch and nailed both free throws giving the Hawks an 86-84 lead with one second left. The Badgers were left with one final chance, but Elgadi was unable to make a fading jump shot, leading to a Laurier victory. “[We were] down by a couple, had to get a good steal and then needed to make the right play at the end. [We] put the pressure on the refs again and they made the right call and I knocked down the free throws when it mattered,” Allin said after the victory. Forde picked up his second-straight double-double and career-high 15 rebounds. Allin chipped in a double-double of his own and led all scorers with 24 points and 12 rebounds. “We slowed down and we started pounding the ball and didn’t really move offensively and then we let them hang around and it ended up being a close one when it didn’t need to be,” Allin said. In a game where Laurier’s starters were red hot in the second half, Brock got some help from their bench players, who outscored Laurier’s bench 30-17. With this win, Laurier improves to 8-10, which has them tied with Western in third place in the OUA West division. The Hawks will look to build on their hard fought victory on Friday and Saturday when they take on the Lakehead Thunderwolves in a double header. Both tip offs are set for 8 p.m.